Dr. Raúl Ricardo Alfonsín, who died yesterday at the age of 82, will very likely be judged more fairly by history, as the major statesman he was, than he has been in his own lifetime. The former president of Argentina has often been more highly criticized for passage of the so-called “Full Stop” Law – putting an end to trials against repressors who kidnapped, tortured and murdered citizens and foreigners alike under the military’s bloody National Reorganization Process – or for leaving office six months early (after what was arguably the most arduous presidency in Argentine history) than he has been praised for taking the former military juntas to trial or for capably putting down an extremist military revolt that threatened to immerse the country in civil war. In terms of the unrealistic expectations that President Alfonsín’s rise to office generated and the largely unfair criticism that his administration’s term in office ultimately elicited, parallels might well be drawn with the Obama Administration in the United States. In both cases – and making allowances for subtle degrees of ignominy - the voting populations were reacting to eight years of unprecedented abuse of authority, disrespect for human rights, undermined rule of law and hidden yet clearly underlying economic chaos and manipulated stagnation. Like Barack Obama, Raúl Alfonsín’s election victory brought an almost delirious outpouring of popular celebration. 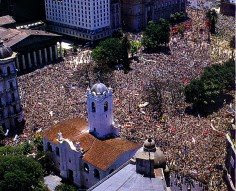 Dr. Alfonsín’s December 1983 rise to office produced a spontaneous manifestation of public support that choked the streets of downtown Buenos Aires and the lawn of Plaza de Mayo in front of Government House with cheering crowds estimated at well over a million people. Never before had Argentine politics witnessed such a mass demonstration of political frenzy and celebration – not even in the days three decades before when Juan and Eva Perón harangued the “descamisados” from the balcony of the presidential offices. For nearly a decade – starting with the reign of terror that began even before the 1976 military coup, provoked by the band of thugs that formed part of the entourage surrounding Isabel Perón when she took office following President Juan Perón’s death in 1974 – Argentines had lived in fear of authority, in fear of politics, in fear of almost anything but going from their homes to their jobs and from their jobs back home. President Alfonsín, very much like President Obama, seemed to represent the blazing beacon at the end of a very dark tunnel. And the brilliance of that light made Dr. Alfonsín – like Mr. Obama – seem just a little bit bigger than life. Such tall expectations, however, can be a true liability. Colorless leaders in boring times have the advantage of being quickly forgotten and free from blame. Leaders of great promise are subject to close scrutiny and to myriad accusations when what they seek to achieve falls even slightly short of the mark (as witnessed by the campaign of “de-mystification” mounted against President Obama from his first hour in office and the demands that he keep his campaign promises word for word and show instant results after only two months in office). The newborn democracy that President Alfonsín inherited was, in a sense, a “democracy by permission” from the military. It was semi-transitional in the sense that there was nothing unconditional about the political and judicial power in place at the time. The military had taken steps to ensure that its members would continue to enjoy the impunity they had during their seven-and-a-half-year usurpation of power: General Reynaldo Bignone, the last in the series of dictators at the head of the ‘Proceso’, handed a sweeping general pardon to all military personnel and officers for their part in the massive human rights abuses and murders that took place under the regime. Considering the earlier half-century of Argentine history, in which elected presidents had been removed from office like barely tolerated pawns by one military coup after another, it was a truly bold move on Dr. Alfonsín’s part to rescind the Bignone pardon and push ahead with the long and highly publicized trial of members of successive ‘Proceso’ juntas. Bolder still was his forming of the National Commission on Missing Persons (CONADEP), the high profile of which he ensured by asking world famous Argentine novelist Ernesto Sábato to head it. The CONADEP did its job swiftly and thoroughly, bringing home the truth about some 30,000 disappearances under the military regime by gathering documentable evidence on as many cases as possible. When Mr. Sábato handed the report to Dr. Alfonsín, 8,900 victims of State terror were no longer stuck forever in the limbo of “the disappeared”. Suddenly, they had names and faces and the details of their abductions, incarcerations and deaths were published in black and white for all the world to see. And people like Lieutenant General Jorge R. Videla – the emblematic first president of the dictatorship – who had cynically stated that the word “missing” said it all, that those who had disappeared simply “didn’t exist”, was now in court, sitting before the special tribunal at a table with the other ‘Proceso’ accused. Despite the fact that successive military uprisings led by insurrectionist extremists in the middle ranks from lieutenant colonel down would force the president to negotiate an end (albeit temporary) to further court action against the former regime, the trials and sentencing against the general officers of the military juntas stood, in what was an unprecedented victory for national democracy. And Dr. Alfonsín made other rapid inroads against armed forces domestic dominion, by shifting the concentration of military might away from the Federal Capital and into areas of strategic importance in case of foreign attack, as well as by restricting the economic autonomy of the Armed Forces. One of the major ways in which he did this was to remove the country’s top defense contractor, the powerful Fabricaciones Militares, from Armed Forces control and place it under the administration of the Federal Government. This was a move so unpopular within the military that the Alfonsín Administration was forced to order literally scores of general officers (generals and admirals) into retirement to quell opposition to the action and thus prevent organized resistance. Despite concessions made in putting down the revolts of the so-called carapintadas (painted-faces) – a relatively reduced group of military rebels who hid their identities by smearing their faces with camouflage grease-paint – President Alfonsín demonstrated outstanding leadership in not only rallying public support from the civilian population, but also by maintaining the backing of the bulk of the Armed Forces, in the face of a situation that could well have sparked civil war and the return of a military faction to dictatorial rule. Even the “Full Stop” on prosecution of military men accused of human rights abuses and crimes against humanity was not an outright ban as such. It limited legal action against several hundred suspected repressors to trials against only those who could be indicted within a 60-day period following passage of the law. Be that as it may, due to the reluctance to testify of many of those who had suffered at the hands of the ‘Proceso’ and considering the plodding pace of the Justice System, a two-month statute of limitations was practically an effective ban and clearly compromised the otherwise stellar return of rule of law in Argentina. But in all fairness to Dr. Alfonsín, and in 20-20 hindsight, at that point in history, his pragmatism on this point is very likely what kept the country from being plunged back into a pending coup mode – and this time led by rightwing extremists who would have made the ‘Proceso’ look like a walk in the park. Furthermore, his democratically elected successor, opposition Peronist politician, Dr. Carlos Menem, far from rescinding the amnesty, further sealed it, by promoting the so-called “Due Obedience” Law. This law basically stated that the former juntas that had already been tried and convicted were the only officers responsible for the horrendous crimes of the ‘Proceso’ era and that all others were “only obeying orders”. Despite the Nazi-like ‘logic’ behind the tenets of this law and the international precedents for placing no statute of limitations on heinous crimes against humanity, it is only now, a quarter-century after Dr. Alfonsín’s election triumph and nearly two decades after the Menem Administration took over from him, that the ban has been lifted and a handful of aging repressors are finally tottering before the court for indictment and trial. Despite such setbacks, with the election of President Alfonsín, Argentines breathed a new air of freedom on the streets of the country’s cities. For the first time in decades, citizens could look policemen and military men in the eye and not fear being detained, beaten or tortured on an arbitrary whim. The government went from being the nation’s jailer to being at the service of the people and the law. The courts became independent of Executive “oversight” and people’s civil and human rights were fully and demonstratively respected. Journalists, politicians and the common folk regained their voices and posed their opinions. Dissidence was once again considered a right, and taking a stance almost became a moral and ethical obligation. Artists, writers and intellectuals who had lived in exile – and often in hiding, even abroad – came back by the score, some with pre-adolescent children, or husbands and wives, who had never known their spouses’ or parents’ native land. It was a celebration of freedom and democracy, a national honeymoon with a new destiny. But expectations were blatantly unrealistic and jealous political motivations made them even more so. In the end, President Alfonsín would find himself embattled and berated on all sides, in spite of his having consolidated a new national legacy of democracy, ethics and respect for the individual like no other in recent memory, and having done it all in a mere half-decade. In point of fact, President Alfonsín’s most powerful enemy – like that of President Barack Obama – was the economy he inherited. And his merciless political opponents, particularly in the Peronist movement, used it to their advantage to undermine his government’s popularity and credibility at every turn, while creating a climate of impending chaos. The chief opposition party made use of its pressure groups, and particularly of the Peronist labor unions grouped under the General Federation of Labor (CGT), to severely hamper the administration. While to his credit, firebrand CGT leader Saúl Ubaldini had previously organized several nationwide general strikes against the military, during President Alfonsín’s administration he promoted no fewer than 13 general stoppages that paralyzed the country. The economy inherited from the military was in ruins, with the juntas having run up tens of billions of dollars in foreign debt spent on Pharaonic projects and arms for a near war with Chile and an effective conflict with Great Britain – the Falklands (Malvinas) War, the loss of which spelled the beginning of the end for the regime – at a time when international interest rates were on the rise. Although the country was recording modest growth and a better than modest trade surplus, these attributes were ravenously swallowed up by the looming shadow of the burgeoning international debt, which had reached crisis proportions. Already by the end of the military regime, following the South Atlantic War fiasco, the country’s inflation was soaring at around 18% a month. But by Dr. Alfonsín’s second year in office, it had skyrocketed to almost twice that much, breaking world records, and the country’s currency was devalued practically by the hour. Seeking to counter this and inject new confidence into the economy, the Alfonsín Administration created a new currency, the austral, which was swapped for the old peso argentino at a rate of a thousand pesos to one austral. President Alfonsín tied promotion of the new currency to the similar promotion of a plan to move the Federal Capital from Buenos Aires to Viedma, gateway to Patagonia, seeking to de-concentrate the population in and around the country’s largest city, while sparking a wave of development and settlement in the largely under-populated interior of the country. Meanwhile, the administration sought renegotiation of the foreign debt and injections of new direct foreign capital investment into the economy. But for the most part, international confidence in Argentina’s economy was shattered and the crisp new austral, that had opened foreign exchange trade at a higher than parity rate against the US dollar was not sufficient (even with imposed product price controls) to stem the tide of rampant inflation at home. Complicating matters still further, Ronald Reagan was president of the United States and was clearly unfriendly to the Alfonsín Administration. Mr. Reagan had had two years to get to know the military regime and one of his first acts back then was to send word to Buenos Aires to tell the ‘Proceso’ leaders that the Jimmy Carter era, with its human rights priority in foreign diplomacy was over and that the military’s stand against international communism was more important now to Washington than the atrocities the regime had committed against its own citizens. Even when the regime took over the South Atlantic islands and courted war with Britain, the ‘Proceso’ managed to maintain fairly civil relations with Reagan’s Washington. US-Argentine relations became severely strained, however, when the Alfonsín Administration withdrew support for Washington-backed Contra guerrillas that were resisting the leftist Sandinistas that overthrew pro-US dictator Anastasio Somoza in Nicaragua. The ‘Proceso’, for its part, had been providing the Contras with material support in order to win favor with Washington. The Alfonsín Administration further miffed Reagan by turning down an offer to reinstate US arms sales to Argentina, telling Washington that “arms were not a priority” for the nation’s new democratic government. So it was that the Reagan Administration remained less than receptive to Buenos Aires on principle throughout the rest of President Alfonsín’s term in office.In spite of the lack of solidarity shown by Washington and the flurry of rising criticism over the “Full Stop” Law from formerly staunch allies in the international human rights movement, the Alfonsín Administration managed to start mending fences with Britain and to promote the end of a border dispute in the Beagle Channel with neighboring Chile, as well as scoring numerous other international diplomatic victories and positioning the country as a moral and ethical force in the Americas and the developing world. But without the economic help and massive investment that the country needed to rise above its economic woes, the moral capital accrued and the democratic legacy constructed by the Alfonsín presidency was doomed to be overshadowed by impending economic and social chaos. Hyperinflation spun out of control, rendering the austral worthless and opposition political shock forces took advantage of the confusion to organize rioting and supermarket looting that thrust the country into a nightmare of disorder and decay. By the end of Dr. Alfonsín’s presidency, most people had forgotten what his election had signified for democracy and what his outstanding leadership had done toward consolidating the republic and ensuring that the ‘Proceso’ was the last of Argentina’s myriad de facto governments. 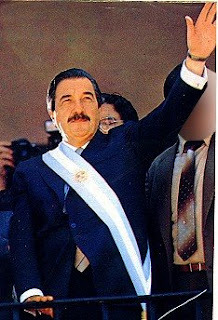 Top - President Alfonsín wearing the Presidential sash. Lower - Crowds jam Plaza de Mayo on Inauguration Day. Dan, this is an excellent, clarifying report on Dr. Alfonsín's presidency. You've left nothing out. Inaugurating a "new" democracy in those times was an extremely complicated challenge. Like walking a tightrope, with the military always breathing down one's neck (no safety net). And precious little support from high places in developed countries, where communism continued to be the boogie-man, and probably still is. Whereas the real enemy is nearly always within...ready to trip unwary (or plain stupid) leaders into dangerous actions, WAR on innocents, to be exact.